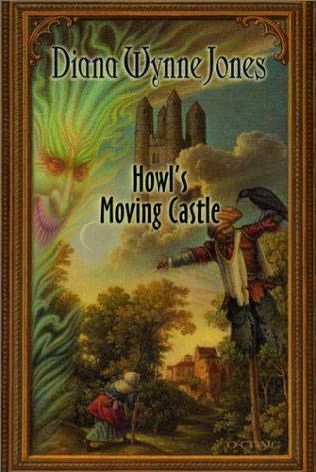 Excellent news, fellow book-readers: Not only does my reading block seem to have been defeated, but I've also finished the book it forced me to put down so much against my will: Diana Wynne Jones's Howl's Moving Castle. I'm happy to report that this book was extremely enjoyable from beginning to end. That said, I'm rather disappointed about the book's gender politics. In true fairy tale fashion, we are presented with a misunderstood wizard (Howl), a skittish and reserved young lady (Sophie) who is cursed in life-changing fashion by a sexually dominant witch (the Witch of the Waste). Specifically, Sophie is transformed into a shrivelled old lady from the lovely young woman she doesn't realize she is. Having been thus translated, Sophie hies her crickety bones hence and begins wandering the land to try to figure out how to reverse the spell. She ends up as Howl's cleaner in his moving castle. Many unique and incredibly fun adventures ensue as the well-written story moves towards its inevitable climax, in which Howl and the Witch engage in a battle to the death. Now, where Jones takes a somewhat different tack from the usual fairy tale clap trap is that Sophie turns out to be a witch of not inconsiderable power. It is Howl who defeats the Witch of the Waste and her fire demon, but if Sophie hadn't kept her fire demon at bay while Howl was unconscious and, literally, given him back his heart after freeing it from his fire demon, he wouldn't have lived to do so. She's got power but she doesn't win the day. Which is fine, I suppose; she is afflicted with a rather debilitating case of family of origin anxiety. My problem is that she doesn't realize she has witchy powers at all until she's told, and she can't figure out how to use them effectively until Howl gives her some pointed advice - and even then, things are going wrong and can only be righted when Howl wakes up. Jones then seems to take a glance at the fairy tale ending by having Howl's suggestion to the newly un-cursed Sophie that they "live happily ever after" followed directly by both of them acknowledging that by "happy ending" they mean something like "extremely bumpy and fractious ride". It could be a send-up - or, it could be Sophie settling for a wizard she may very well have been magicked into falling in love with in the first place. Hmmm. Meanwhile, Sophie's sister Lettie - pushy, confident, and also talented in witchy ways - is finding out that the milksop she thought she was in love with is actually a recently un-cursed wizard with powers far superior to her own - and whose aggressive last words to her are that he'll be happy to accept her as a student! In the end, Jones's story reiterates many of the fairy tale ideologies surrounding gender she seemed at points like she might be questioning, for the only really powerful female character, The Witch of the Waste, is dead - at Howl's hands. And, of course, the other potentially powerful female characters are gathered safely back into the fold of dominant male authority. Now, I'm not saying that I enjoyed this book less because of its ultimately very traditional gender values. I am noting that the possibility of female power (such an over-used and increasingly meaningless phrase; I wish I were less buffleheaded from the hellish hot heat so I could think of something new and better) in fantasy fiction, YA or otherwise, seems 99% of the time to end up this way. If this weren't so common, Terry Pratchett wouldn't have had so much to so easily make fun of in Equal Rites. I wonder why this continues to happen and when I try to think of exceptions, all I can come up with are Pullman's His Dark Materials trilogy (but then, Lyra is a bit too young for such things to really be issues yet) and Garth Nix's Abhorsen trilogy, in which Sabriel is truly the hero; when she and Touchstone marry, they are made to appear as though they have a marriage that really is based in equality. This is also one of the reasons why I liked Y.S. Lee's first novel, The Agency: A Spy in the House, so much: Mary Quinn and James Easton have sexual chemistry, in spades, but Mary is not overwhelmed by it. Indeed, she is aware that to choose to succumb to it means losing other opportunities in life she mightn't want to lose - the point is, she contemplates the consequences of acting on this particular desire. Fairy tale females, including Sophie Hatter, do not contemplate such consequences - and this is what I find annoying - even when they are presented as being able to contemplate the consequences of every other action they consider taking. Saying yes to the sexually compelling man is too often presented as a question that doesn't even need to be asked. This brings me to something I've been thinking about since the weekend, in relation to YA fiction geared specifically towards girls. Hubby and I had dinner with some friends on Saturday and we had some discussion about Twilight, which one half of the couple forced her book club to read. It was theorized by someone in the book club that one of the reasons girls like these books so much is that Bella is just a normal, kind of weak, kid; she is in no way special, and this is compelling because girls don't want to have to feel that they need to be at all strong or in any way special. If this is true, I must say I find it extremely disheartening but in no way surprising for this is what's really at the heart of fairy tale gender politics: in the end, it's the sexually compelling male who one doesn't even need to consider saying no to, that makes the girl exceptional; she is made exceptional precisely by the exceptional male who chooses her. In Bella's case, a beautiful, sparkly vampire AND a REALLY sexually compelling in a deliciously animalistic but restrained werewolf add meaning to a life seemingly without hope of...well, much of anything; for Sophie and Lettie, two powerful wizards both confirm and contain their magical powers. In Cinderella's case, the wealthy prince...ad infinitum. Like all fiction, YA fiction and fairy tales fall firmly within the category of the imaginative, the fantastical. But these things do not ipso facto preclude the insertion of problematic ideologies into narrative and plot; indeed, as scholars of children's lit may suggest, fantastical narrative details may make such inclusions harder to detect. I don't know if I would like to insist YA authors think harder about this or not; too often, authors who decide to be polemical in their fiction writing produce literarily disappointing works, which can only make the polemic less effective anyway. At the same time, one wishes for a book world in which Pratchett's parodying of such conventions weren't so effortless and the results so recognizably apt. Also, that so many girls would apparently rather be placated than inspired depresses the hell out me. Stay tuned for my post on my daughter's 'Topsy and Tim' books where I analyse turn-taking roles and the use of first-person pronouns by gender to argue that the book is preparing little girls to be submissive in adult life. Castle in the Air kind of does a 180 on Sophie's personality if I remember right. But I guess she'd have to be considering her circumstances. I didn't like House of Many Ways all that much either. is there perhaps a sequel to this book where Sophie and Lottie realize their power and throw off their roles as good little girls? Angela Carter makes great fun of gender roles in fairy tales. I don't think YA authors would need to risk being polemical in switching up roles for girls they just need to tell good stories where girls don't have to end up submitting to the males. You wouldn't think that was such a hard thing to do but apparently it is which is very sad. Another great post, Colleen! I haven't read this book, but I did see the anime, and it sounds like Sophie in the cartoon was a little more self-aware and aggressive. If I remember it correctly--I probably don't. But the ending with with Sophie and Howl's HEA was also kind of disappointing there. I think the idea of an ordinary girl attracting someone extraordinary is definitely part of the appeal of Twilight and other romances; but I also think it's the idea of never feeling alone that's one of the reasons people of all ages like that book so much. I would have to disagree when it comes to fairy tales, though; for one thing, there's many different versions of most fairy tales, so it's impossible to make such a blanket interpretation of them. For another, I would say fairy tales are less about finding a handsome prince than navigating dangers in life--evil stepsisters, men who keep dead wives in their closets, etc. The princes in most fairy tales always seem to be kind of incidental. Graceling by Kristin Cashorne is a great example of a contemporary YA fantasy that turns the fairy tale girl's role on its head. Aside from a rather bumpy beginning, the novel quickly picks up pace and becomes a wonderfully compelling read. The female protagonist is strong, deadly, and physically proficient. She has no interest in marriage, ever, nor does she want babies. The male protagonist, too, inverts traditional masculinity in a way I don't particularly want to spoil. Anyway, it's a great little novel and I was terribly impressed. Tony: I love you, Tony, but I can't respond to accusations, tongue in cheek or otherwise, of "analyzing a story to death." I demand more original abuse from you (and the rest of the world). Moony: Sophie's story continues, eh? I will check it out! Stefanie: I am a fan of Angela Carter, but it's been a while. Perhaps I'll revisit her stuff! 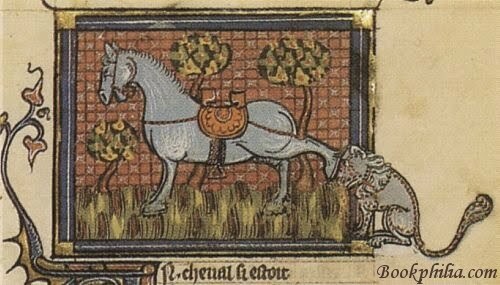 heidenkind: We're clearly reading different fairy tales! I'd like to read the ones you're reading. R.K.: Sounds interesting - I'll keep an eye out for it! chasingbawa: Another endorsement of Graceling! I will definitely look for it. As for expectations about authors' gender and their characters...I can't speak to others' expectations, but that's not mine. But then, having taught literature I was in a constant battle with my students to stop imagining that strong/not strong was the only way they could discuss female characters. For me, it's just that the gender stereotypes are so prevalent in certain sub-genres that I can't help but wonder what it's about, and be a bit frustrated. I don't require strong per se; I do want complex and some degree of unpredictable though. I didn't much like The Gracling (mostly because of the writing, to be honest)though I am in the minority with that. But I do highly recommend The Hunger Games and its sequel. It does very interesting things with its heroine Katness and the situation in which she finds herself and the decisions she makes. Thanks for the kind words, Colleen. I do agree with you about the charm-slaying powers of dutiful, self-conscious polemic and wouldn't wish that on any reader. Having said that, it shouldn't be so difficult for YA authors instinctively, preconsciously, to imagine a more balanced relationship between the sexes. Double argh? "You swollen-headed flunkey, we will transform your country into a sea of fire!" Celine: I've heard good things about The Hunger Games before. Also, I like the title - sounds terrifying! Ying: Well said. Double argh, indeed.